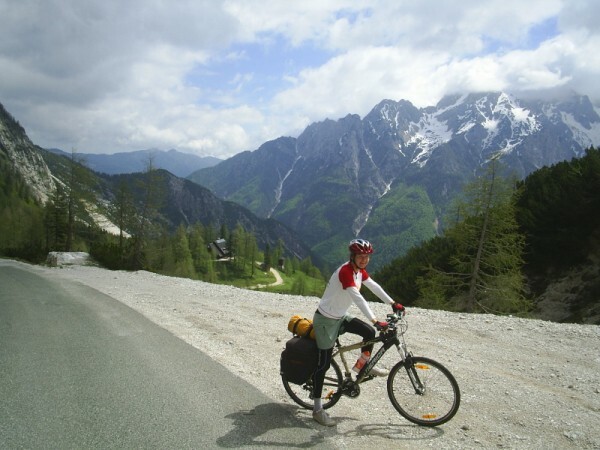 This was the big day – over the Julian Alps via the Vršič Pass. It was a sunny morning which was great for the views. It’s about a 13km ride to the top of the pass (1611m), with approximately 800m of climb. The road is quite steep, but would be much worse if it weren’t for the hairpin bends. Each of the bends is cobblestone and a bit bumpy, but has a numbered sign with the altitude which gives a wonderful sense of progression. There are 24 numbered hairpin bends to the top. Along the way there are huts, hikers, and some of the best views around. The 26 hairpin bends on the way down were very fast and fun, and with even better views. At the foot of the mountains we met up with the Soča river which we followed most of the day. 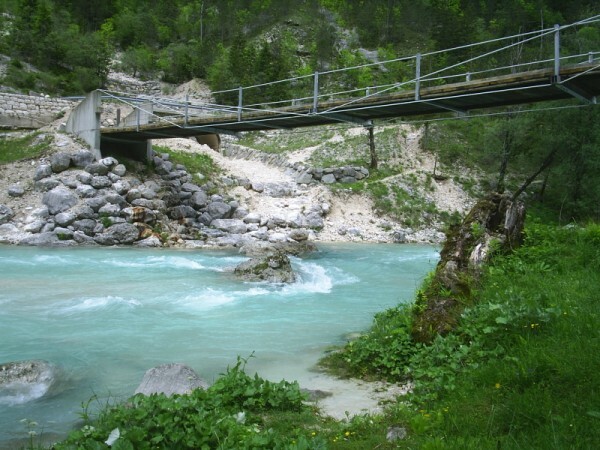 At its best the Soča is supposed to be a bright emerald green. It was quite cloudy for us because of all the rain, but still a beautiful green. In fact the whole day there was very little that couldn’t be described as beautiful, including the place where we had lunch by a footbridge over the river. We stayed the night in Camping Vili, which was a minor highlight in itself. It was right beside the river and Vili himself was a very talkative and energetic character. He also cooked a good dinner of trout and allowed us to dry our shoes in their house. Basically it was a very homely and welcoming camp ground. I had been looking forward to this part of the trip and it exceeded my expectations. The climb was hard work, but wouldn’t be too much of a challenge for most seasoned cyclists, and it’s worth it. 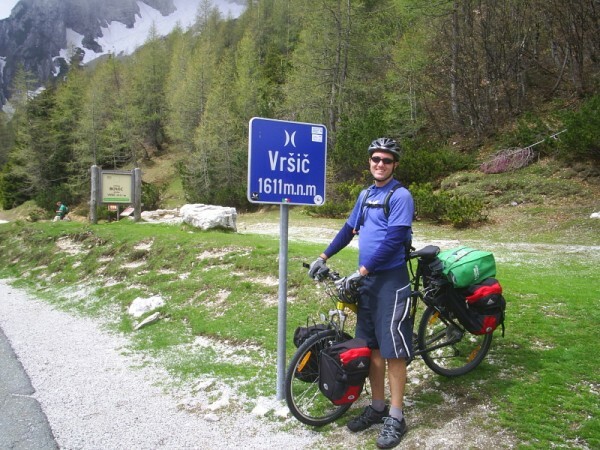 This entry was posted in Slovenia and Croatia and tagged Julian Alps, Slovenia, Soča River, Volarje, Vršič Pass by wally. Bookmark the permalink.